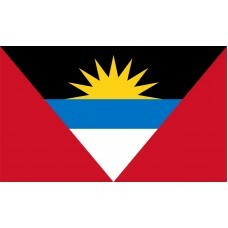 The Antigua and Barbuda Flag features a red background with a large triangle pointing downwards that resembles the shape of a "V." Inside the triangle (the "V" shape), there are three horizontal sections: Black, blue, and white. The black section features a 7-point golden sun. The color red symbolizes the passion and energy of the people of Antigua as well as slavery, the color blue is used to represent hope, black represents the soil and African ancestry, and the seven-point sun illustrates the 6 parishes of Antigua and its sister-land, Barbuda. Additionally, the sun represents the "dawn of a new era." The blue, white and yellow colors in the triangle are used to personify the sun, sea, and sand of the islands and the "V" symbolizes victory. 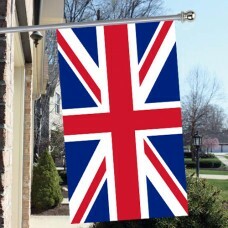 Following the islands' independence and achievement of self-government in association with Britain, on February 27th 1967, a contest was held to create the design for the new national flag. Reginald Samuel, who is an artist, sculptor, painter and teacher designed the Antigua and Barbuda flag won a competition. Samuel's design makes reference to the history of the island and also signifies the future. Antigua and Barbuda are islands on the Caribbean Sea that were part of the British colony between 1632-1981. They are the sunniest and warmest of the Caribbean Islands with warm weather all year round, although they have been prone to hurricanes. Due to the very low rainfall, you will only find 3 streams in Antigua and no rivers. Antigua was named by Christopher Columbus after the "Church of Santa Maria de la Antigua," in Spain. The first inhabitants of the islands were natives called the Arawak which means, "Stone People." These native people were known for their beautifully crafted stone and shell tools. Shortly before becoming part of the British colony, Antigua and Barbuda was occupied by West Indies tribes. When the islands came under British rule and more British people and Africans arrived on the islands, the first sugar estate was settled in 1674 and slavery was introduced and not abolished until 1834. 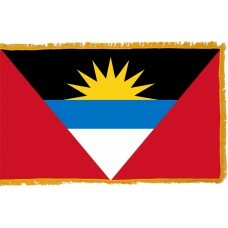 On November 11, 1981, both islands were granted independence as the "modern state of Antigua and Barbuda." 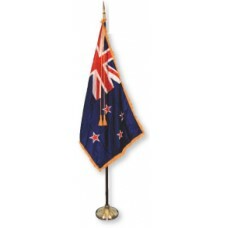 Queen Elizabeth II is the head of state and the country is also a member of the commonwealth. Despite being such a small set of islands, the country attracts many visitors. In fact, tourism contributes to over half of the economy with over 700,000 tourists a year. The country is commonly referred to as the "Land of 365 beaches," due to the abundance of luxurious beaches. On the Southwest Coast of Barbuda, one of the most famous attractions is a pink sand beach. The uniquely colord sand is the result of crushed coral. Other attractions include Devil's Bridge (a bridge that was carved by sea water, forming a rock arch) and Mt. Obama as well as all many other beaches, lagoons and harbours that encompass the islands. A popular event that occurs in the country each year is the regatta at Nelson's Dockyard which is one of the top regattas in the world. Fair Antigua and Barbuda We thy sons and daughters stand Strong and firm in peace or danger, To safeguard our native land: Wecommit oursleves to building A true nation, brave and free! Ever striving, ever seeking Dwell in love and unity. Raise the standard! Raise it boldly! Answer now to duty call: To the service of your country, Sparing nothing giving all! Gird your loins and join the battle Gainst fear hate and poverty: Each endeavouring, all achieving, Live in peace where man is free! God of nations, let thy blessing Fall upon this land ours Rain and sunshine ever sending Fill her fields with crops and flowers: We, her children do implore thee: Give us strength, faith, loyalty: Never failing, all enduring To defend her liberty.